Birding Is Fun! : Have You Observed Unusual Bird Behavior? If you enjoy watching birds and observing their behavior, at some point you will observe them doing strange things or things that most people have never seen before. If you haven't encountered any bizarre or strange behavior yet, just be patient and keep watching, because you will. 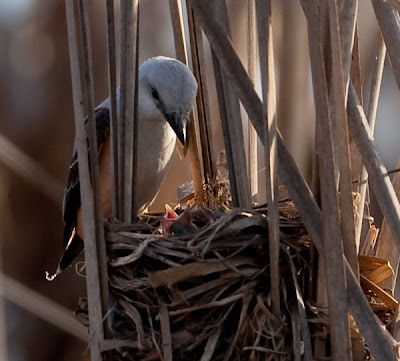 One of the strangest events, that I was fortunate to observe during my bird watching, and the one that stands out to me the most, is when I saw a Scissor-tailed Flycatcher helping a Red-winged Blackbird feed its young. Having 2 different types of birds working together to feed one type of young is a rare occurrence. This is certainly not a common thing. Would you believe this story if I had explained it to you, even if you know just a little about bird behavior? I wouldn't. I was lucky that day in several ways. I got to witness this bizarre behavior and I had my camera to photograph it. The photos below document this event. The first photo shows the female Red-winged Blackbird sitting on the nest with the Scissor-tailed Flycatcher standing by. This alone is strange behavior. The second photo shows the female Blackbird feeding a Dragonfly to the Red-winged Blackbird young and the third photo shows the Scissor-tailed Flycatcher feeding them. 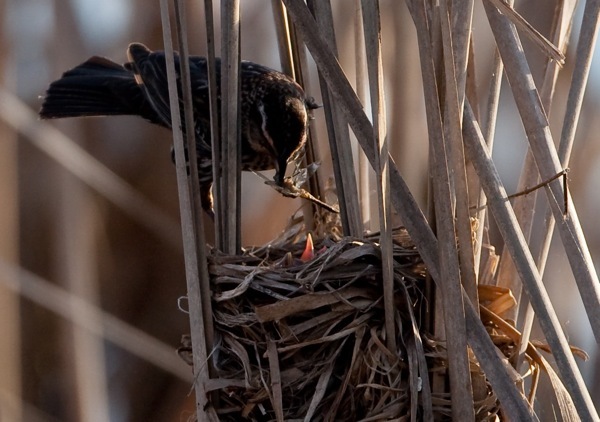 What these photos don't show is that both males, the Redwing Blackbird and the Scissor-tailed Flycatcher are nearby and neither is concerned, at all, with each other or what is going on at the nest. 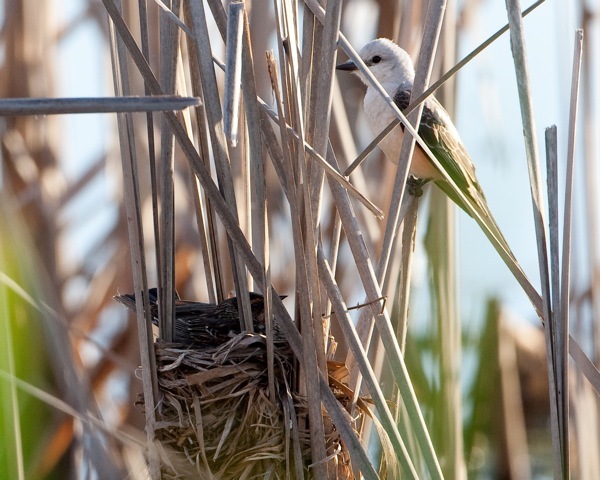 Have you experienced any unusual behavior in bird watching? Share it with us in the comment section. We would love to hear your story. This is a fascinating documentation Steve! Wow Steve, this should be published in a magazine! Great stuff! In the past week, I have had small birds (type unknown) continuously fly into the side mirrors of the two cars parked outside in my driveway here in So Cal. Seems to happen early in the morning. This has resulted in scratches to the paint, as well as, shall we say, a fair amount of "white" residue resulting from these encounters. I am at a complete loss over this behavior. Many years ago I had both Spotted Towhees and Bushtits nesting in my yard in the Willamette Valley (Oregon). One year, one of the Towhee fledglings decided he was a Bushtit - he followed the flock around the yard relentlessly, mimicking their behavior. When they landed on grass that would withstand their weight but not his, he would follow suit, only to find himself on the ground slightly dazed. But then he'd pick himself up and be tagging along again. If you think about how totally differently the two species behave, you realize just how incongruous and funny it was! No photos but it is etched in my memory. Thanks for the great stories so far! Has anyone else had an unusual encounter? That's amazing! One of the more bizarre behaviors I've ever heard about. Last year I noticed a bluebird family (parents and 5 youngsters) perched atop one of the electric wires on our property. The parents were busy hunting and bringing the insects back to their hungry offspring. One of the birds looked too small to be a bluebird so I focused in on it with my long camera lens. It was a little begging Chipping Sparrow. I never saw either of the adult bluebirds feed this young sparrow, though. The chipper did stay with this beautiful bluebird family for some time. The sparrow also bathed in the bird bath with all the bluebirds. Strangest thing I saw was earlier this summer (in N. Illinois), one warm sunny day, suddenly about 30-40 sparrows (?) congregated in my yard. First there was a lot of anxious (at least that's how it sounded to me) tweeting & calling, as if they were giving an alarm) and then all these birds came a perched in my yard, close the the fence and on the planters on the deck. It was as if they were hiding out and hoping whatever was going on wouldn't find them where they were. (they are used to getting food unharrassed for the most part in my yard). After about 10 minutes they all calmed down and went away. Haven't seen anything like it since. I still have no idea what set them off. What?! That is bizarre. Great shots. We live in southern louisiana and never see bluebirds. For the last week, a male bluebird has been flying around , into, and perching on our kitchen window and leaded glass door, watching us. Even while we take hundreds of pictures, he watches us from a foot away. He hops on the door ledge and peeks in at us through the clear part of the glass. We put out bird seed but he appears to just want to watch us inside. I live in a suburban apartment complex in central GA. We have resident barn swallows and northern mocking birds. 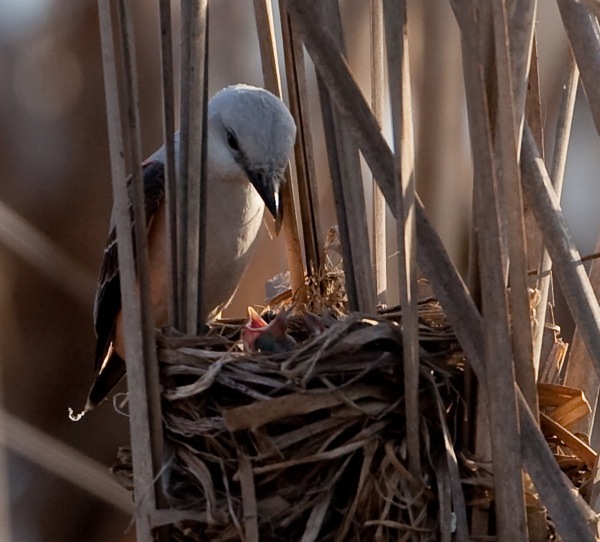 The male mocking birds tolerate the swallows but no others. Occasionally the swallow will chase off large birds that may threaten the swallow's young. Yesterday I witnessed two species, a raven or crow and a larger unidentified hawk like bird join forces in attacking a sparrow's nest. Defending the area were three different species, the barn swallows, the norther mocking birds, and an unidentified robin-like bird. The sustained attack occurred at about 15 foot elevation with all three defending species simultaneously swooping in on the the two attackers. The ravin-like bire eventually did make it into one of the barn swallows nest.